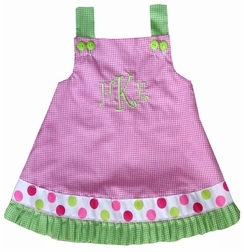 Caroline Bradlee Designs > GIRLS > Hot Pink Dress or Outfit With Lime And Pink Dots Ribbon. 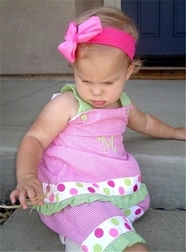 Hot Pink Dress or Outfit With Lime And Pink Dots Ribbon. 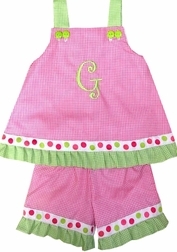 We start with bright and cheerful hot pink gingham and trim it with a lime green gingham ruffle. 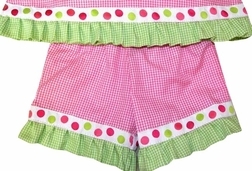 Just above the ruffle is the most vivid and beautiful woven, white ribbon with lime green, pink, and hot pink dots. The shoulder straps are made with lime green gingham. Monogram the dress/top in 1 or 3 lime green initials for extra flare. A must for your little girl!